Editor's note: The author of this article, Charles Rosenblum, is a Pittsburgh-based historian, journalist, and critic of the built environment and visual arts. Over the decades of Pittsburgh’s transformation from an industrial center to a hub of education, medicine and technology, the steel mills and associated plants that once crowded area riverbanks have mostly disappeared. In some cases, fragments of historic sites survive based on their value as industrial heritage or their adaptability into venues for culture and tourism. In a few other cases, factory sheds are reused as office or light manufacturing spaces, if they can compete in the real estate market. But most often, it seems these relics of our industrial roots are razed. Preservationists argue that reusing existing facilities is more environmentally efficient than tearing down and rebuilding, but saving industrial fragments is costly and complex. “The financial lift is so heavy to do this kind of thing,” said Don Smith, president of the Regional Industrial Development Corporation [RIDC] of Southwestern Pennsylvania, a nonprofit developer dedicated to converting the region’s underutilized industrial sites back to active commercial use. The issue is freshly relevant at Mill 19, a 1,200-foot-long industrial warehouse with three 40-ton cranes that RIDC is transforming to house high-tech office space in the middle of Hazelwood Green. The 178-acre former coke plant was largely demolished after LTV Steel closed it in 1998. Originally operated by Jones & Laughlin Steel, the site is undergoing widely publicized redevelopment. The Almono Limited Partnership — a partnership of the Claude Worthington Benedum Foundation, Richard King Mellon Foundation and The Heinz Endowments* — owns 165 acres of Hazelwood Green, and RIDC owns the remaining acres, including the site of the Mill 19 building. Mill 19 is the new development’s first permanent project, intended as a showcase of high-tech redevelopment of an historic artifact. Two other smaller historic structures are still standing: the Round House, built in 1883, and the Pump House, built around 1870. These structures will also be saved, though their future use is undetermined. That preservationist approach is not the norm. “Very often the civil engineering approach [has been] to demolish all the buildings involved and remediate the site,” Rob Pfaffmann, a Pittsburgh-based architect who laments the loss of large post-industrial sites. 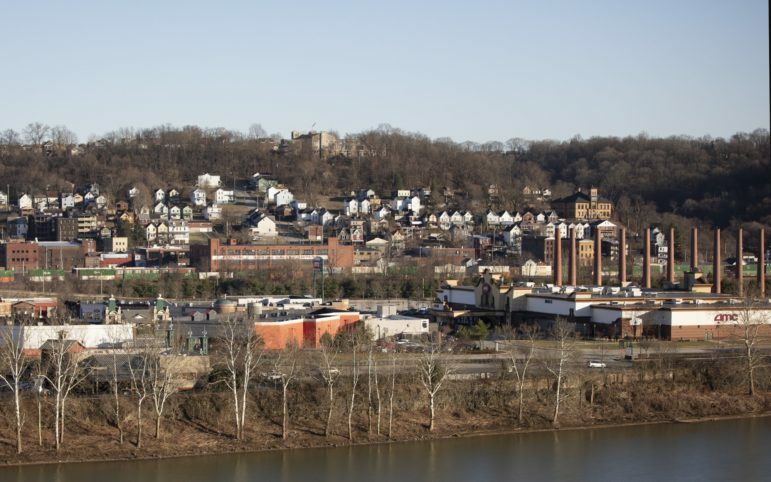 Along the Monongahela River, the 48-acre Pittsburgh Technology Center was also once a portion of the Jones & Laughlin Steel plant, but it bears no significant trace of that history. Not far downstream, much of the Homestead Works is also gone. A row of 130-foot-high open hearth stacks sit near the bank of the river. But much of the site was demolished, replaced by mixed-use shopping at the Waterfront. A few other components related to that complex were saved after concerted efforts by the Steel Industry Heritage Task Force, a group of professional and amateur historians who advocated for preservation. Still standing are the blast furnaces at the Carrie Furnace National Historic Site, the Hot Metal Bridge, the Pump House Water Tower and the Bost Building — the historic former home of the Amalgamated Association of Iron and Steel Workers. 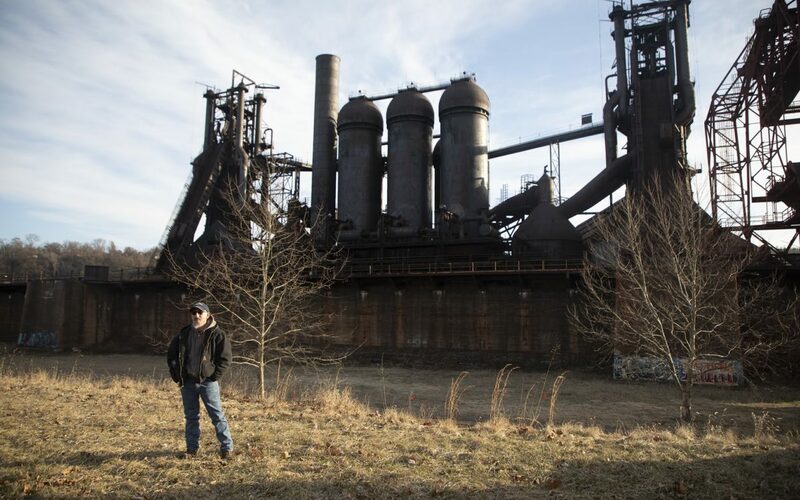 “If you tear it all down…you’re taking away our ability to tell the story of this region,” said Ron Baraff, director of historic resources and facilities at Rivers of Steel, which maintains the Carrie Furnace and other sites associated with the Homestead Works. Carrie Furnaces 6 and 7 were built in 1907 and produced iron for the Homestead Works until 1978. The blast furnaces were designated as National Historic Landmarks in 2006, and the area is open for guided tours. The drive to save the site was partly inspired by a campaign to save portions of the Sloss Works steel mill in Birmingham, Alabama, which was named a National Historic Landmark in 1981. 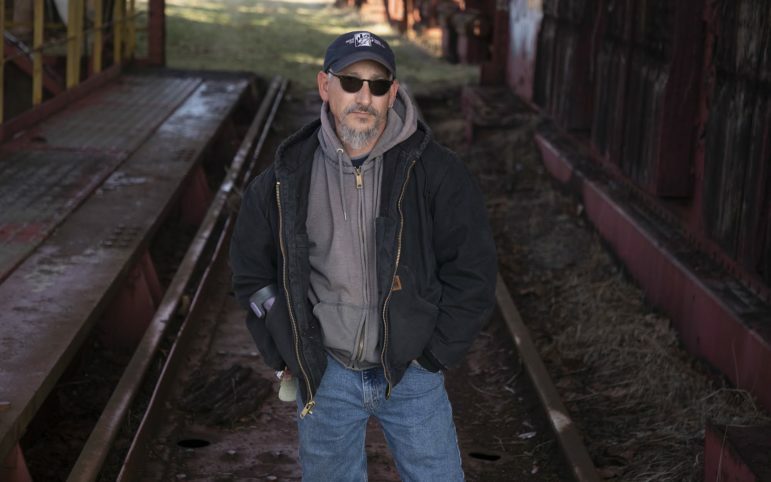 According to Baraff, Rivers of Steel began as the Steel industry Heritage Task Force to preserve pieces of the Homestead Works as a vehicle for economic revitalization, historic preservation and storytelling related to the steel industry’s impact on the region and its culture. In other cities, former industrial sites have been saved after being transformed to public amenities or facilities no longer dependent on commercial profitability. Seattle’s Gas Works includes preserved pieces of an industrial plant that became the centerpiece of a municipal park. In Providence, Rhode Island, the former U.S. Rubber Company plant is now the nonprofit WaterFire Arts Center. SteelStacks in Bethlehem, Pa., is a mix of preserved history and commercial space. The site is an extensive and picturesque complex of historic blast furnace equipment and includes an outdoor concert stage. The artifacts remain because of funding from adjacent commercial development that includes mixed-use office and retail, with a controversial casino on completely redeveloped portions of the site. In Lawrenceville, RIDC has a precedent to Mill 19 in the iconic Blue Building of the former Heppenstall Steel plant. RIDC determined that most buildings in the complex were simply not suitable for adaptive reuse for functional and economic reasons. Before Smith joined RIDC, buildings were cleared to establish parking and access, as well as some green space, Smith said. RIDC kept Heppenstall’s signature Blue Building as an appealing candidate for adaptive reuse. “I love [it] and it’s a cool building,” Smith said, but to make it viable for reuse, it had to be transformed from storage into high-tech offices and labs. “We needed a partner in that project,” he said. “Carnegie Robotics was willing to make an investment” that an average tenant may not have been willing to do. Mill 19 presented a similar but specialized and perhaps more costly challenge of how to save an appealing industrial artifact in need of functional transformation. “There was a commitment [to] retaining that building or at least the steel infrastructure” for its historical heritage, said Rebecca Flora, project director of Hazelwood Green. Reuse also harmonized with Hazelwood Green’s documented sustainability goals. “We like to say that the greenest building is the one that you reuse,” Smith said, citing a mantra that is common among preservationists. RIDC has several reused mill buildings in its portfolio. Keystone Commons, the expansive former Westinghouse Electrical Corporation in East Pittsburgh and Turtle Creek, encompasses 2.25 million square feet of rentable space and includes several rehabilitated buildings. The facility has been continually renovated to accommodate different tenants whose light industrial functions make them more closely adaptable to existing plant conditions. RIDC conducted a limited design competition for Mill 19, which was won by Minneapolis-based Meyer Scherer Rockcastle. The firm was invited to participate based on its previous work adapting industrial buildings. In Philadelphia, former shipbuilding structures were repurposed as a corporate campus for Urban Outfitters. In Minneapolis, the Mill City Museum combines new and historical functional spaces with architectural ruins of the former Gold Medal Flour mill. “Adaptive reuse has been an important part of our work from the early days,” MSR principal architect Tom Meyer said of his 38-year-old firm. For Mill 19, architects chose to build inside the existing building, which was not originally designed to have effective insulation. New office structures are being placed under the roof of the existing structure, protruding slightly to the outside. This leaves a large open-air hallway under the roof with a designed landscape that will span inside and outside spaces. Designed by D.I.R.T. Studio and 10 x 10, the landscape will underscore the openness of the building. The first phase of office space, primarily for Carnegie Mellon University, will be completed in May or June. The second phase is under construction, and the design stage is beginning for the third phase. The large-scale project shows that adaptive reuse is possible despite barriers such as cost. 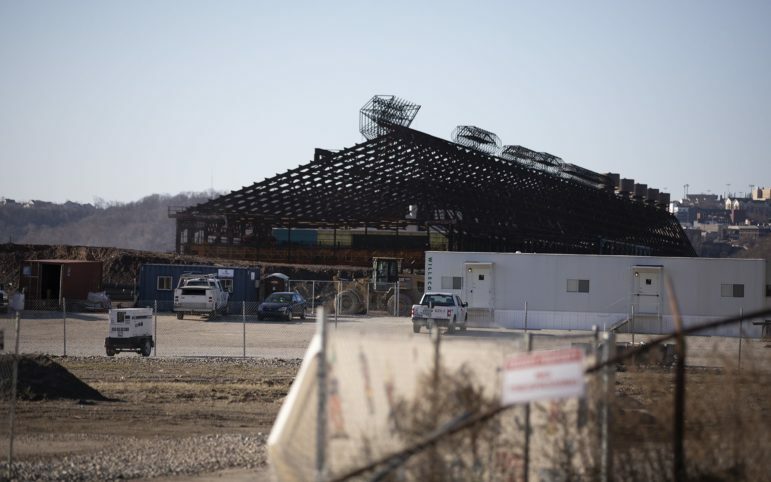 “If you gave it to a real estate developer on a pure cost-per-square-foot basis, it doesn’t make any sense, I’m sure,” said Pfaffmann, who has worked on projects at other former industrial sites, including the Pittsburgh Technology Center. On April 1, Almono LLC announced the official opening of the Hazelwood Trail and public access to Blair Street and Hazelwood Avenue, a precursor to the opening of Mill 19. Designs for a new public plaza are underway, and master planning of new development prioritizes additional reconnections to existing streets in the neighborhood fabric of Hazelwood. Sonya Tilghman, executive director of the Hazelwood Initiative, said she works to ensure that members of the community have a voice in the outcomes of adjacent development. Preservation was “not at the top of most people’s priority list, but there are a number of people who are very happy it’s been saved,” she said. Residents are most interested in convenient public transportation, affordable child care and effective workforce development, so they can work for the firms in Mill 19, Tilghman said. Does it seem like the revitalized Mill 19 will be a suitable place for both jobs and recreation for people living nearby? *PublicSource receives funding from the Richard King Mellon Foundation and The Heinz Endowments. Correction (4/11/2019): : This article previously misstated information about the outdoor stage at SteelStacks in Bethlehem. You can reach Charles Rosenblum at thisisclr@gmail.com and follow him on Twitter at @CharlzR.